Wildlife carers do not recommend giving food to any wild bird including pelicans. Feeding subverts many of a pelican’s natural instincts and behaviors. What initially might seem like an act of kindness invariably leads to suffering for the bird. The pelican’s natural diet is fish. If you feed a pelican anything other than fish it will eventually become sick. They can become listless, underweight and even aggressive. Never feed a pelican meat, chicken or bread. Pet food and pet sausage are particularly bad. Pelicans can’t easily digest and utilize those foods because they contain the wrong proteins and fats and too little calcium. Ultimately they weaken the bird. Pelicans that scavenge from humans breed weak young that struggle to survive. It’s the same as raising a child on a diet of lollies (candy) and potato crisps. That child will have little hope of growing a healthy body. Pelicans that beg for food are not starving and they’re not deprived – they’re just lazy. Filling them up with the wrong food takes away their need to hunt and catch fresh fish. Here on the Gold Coast there is an abundance of wild fish for pelicans to eat. They are excellent hunters and don’t need much food. 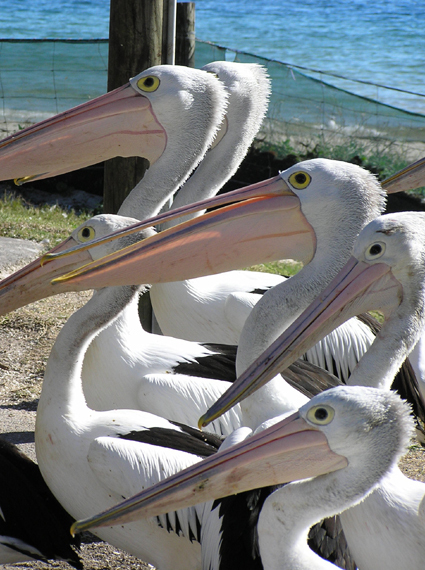 A couple of mullet or bream or a few whiting can sustain a pelican for a whole day. If you insist on feeding pelicans then you have a responsibility to give them the right food. That food is fish (head, bones, guts, scales and all). Fresh fish frames (the head and bones of filleted fish) are also acceptable. Pelicans love whiting, bream and flathead. They’ll eat mullet but are not keen on salmon, pilchards or fish with dark flesh. Buying and storing fresh fish can be costly and inconvenient, but there are ways around this. An economical species to buy is whole mullet, available from fish shops and bait suppliers. Gut and de-gill the fish first. There’s no need to scale it. Then chop the whole fish across the body into pieces about one inch (25mm) long (head, bones, scales and all). Leave enough pieces in the fridge to feed the pelican over the next 3 days and freeze the rest in several small packs each containing a few days’ supply. A couple of small chunks of mullet make a nice treat for a pelican. Defrost another pack as the need arises. Use it all within a couple of months after freezing. Remember, the less you give to a pelican the better. That forces the bird to go out and catch its own fresh live fish. Read stories about successful rescues. See pictures of rescued birds. Please donate to keep the service alive. PO Box 34, Main Beach, QLD 4217.